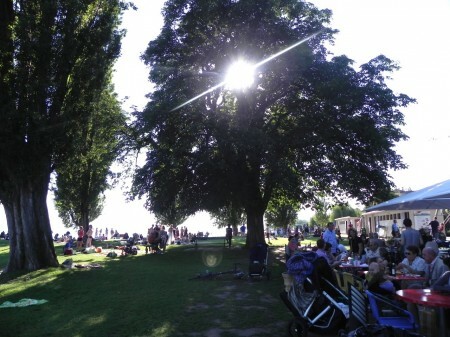 We spent only a few days in Switzerland at the start of our summer vacation. 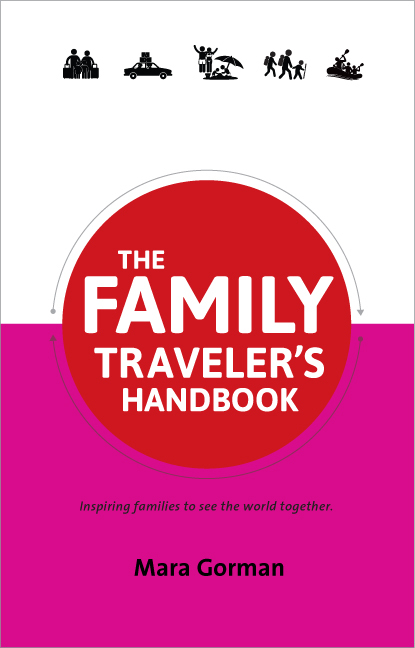 It wasn’t enough time for us to explore much of the country, small though it is, but it was long enough for us to realize that we most certainly must return for a more in-depth visit. That’s because being there was like taking a warm, luxurious bath in scenic beauty. Let’s start with the lake that borders France shall we? You may know it as Lake Geneva; its proper name is actually Lake Léman. 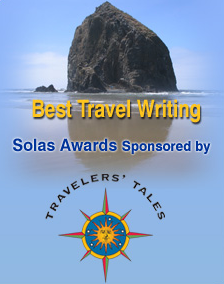 Stay anywhere near its shores and you will quickly realize that it consumes all of your senses. We were lucky enough to visit friends in a house overlooking the water. It would have been almost enough to spend the entire time simply gazing out of our bedroom window. But the lake’s allure is constant and irresistible. In almost no time after we arrived the boys were at the water’s edge, looking for smooth pieces of green beach glass and other treasure and cooling their travel-weary feet in the bracing water. Jet lagged though we were by nearly 24 hours of travel, that evening we went to the nearby village of Lutry for dinner at an open-air café right on lakeshore. 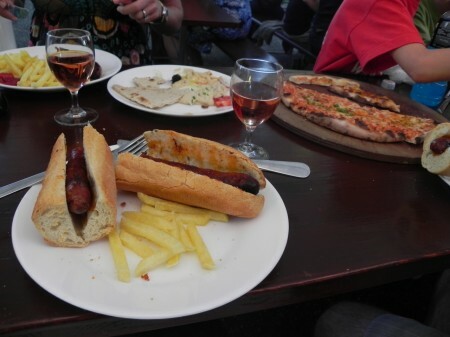 We were surrounded by Swiss families enjoying a Friday evening picnic on the grass, we sampled sausages, frites, and pizza and sipped local beer and rosé in the molten light. Life here clearly revolves around the lake, with public spaces and windows all turned toward it. It seems that every town has a battery with rocks for the children to scamper over at the water’s edge. In Cully, there are also some convenient chairs that invite you to wile away the day. 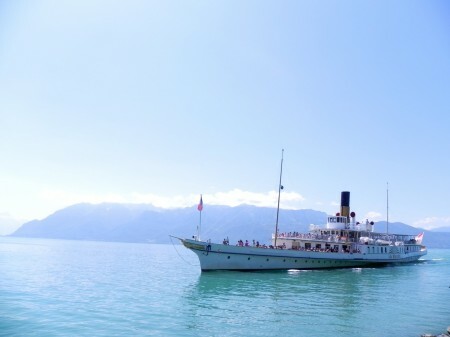 You can also spend a very pleasant afternoon chugging up and down Lake Léman in one of the refurbished paddle steamer that ply its waters. 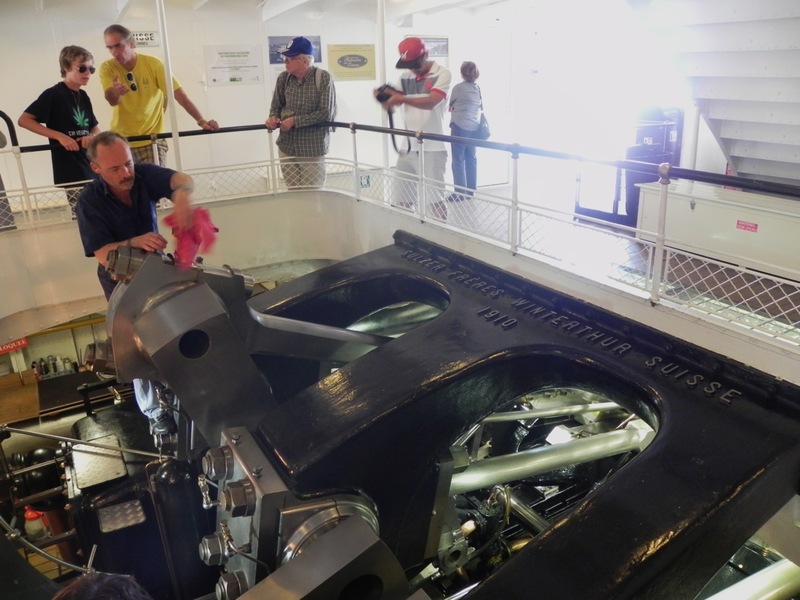 Built between 1904 and 1927, these Belle Epoque beauties have been lovingly restored to their former glory and are full of fun for kids to explore, whether that means watching the engine work or gazing at the mountains in the distance. The boats make calls from Geneva at one end of the lake to the Château de Chillon at the other, so you can use them to get the destination of your choice or perhaps take one of the dinner cruises around the lake. Another vantage point from which to admire the water is one of the local caveau. Terraced vineyards rise up in wide green stripes on the Swiss side of the lake and their products are available to sample in these communal wine bars, which you will find in many of the villages. You won’t taste these wines elsewhere, as the Swiss don’t export them, so take advantage of the chance to admire the lake’s beauty with a nice mineral glass of sauvignon blanc in hand (there’s non-alcoholic grape juice available for the kids). 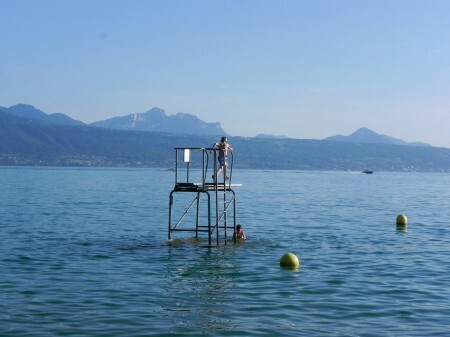 But perhaps the best way to experience the lake is simply to jump into it on a summer afternoon, the simplest of simple pleasures magnified by the warm air, the clear cold water, and the mountains in the distance. If you’re planning a family trip to Italy or France (or both), a stop at Lake Léman is easy to include in your itinerary as it is accessible from either direction either by train or car. 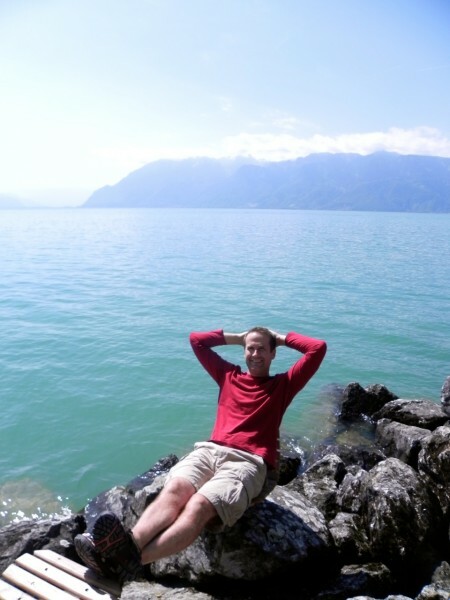 Stay in Lausanne, Vevey, or Montreux and you can easily get to every other point on the lake either by train, boat, or on foot (there’s a path that runs along the lake from Vevey all the way to the Château de Chillon). 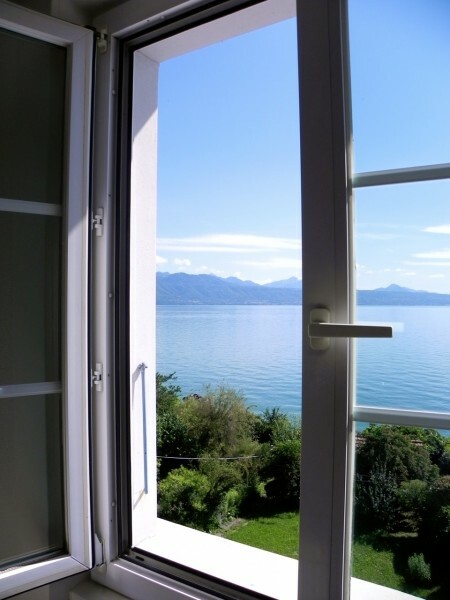 Switzerland is extremely expensive, but I think a weekend visit to Lake Léman would be worth budgeting for. Bear in mind that you don’t need to plan elaborate activities or meals – picnics, strolls, and swims in warmer weather will keep everyone happy. The wine is cheap, and frankly, the views are worth the price of admission. 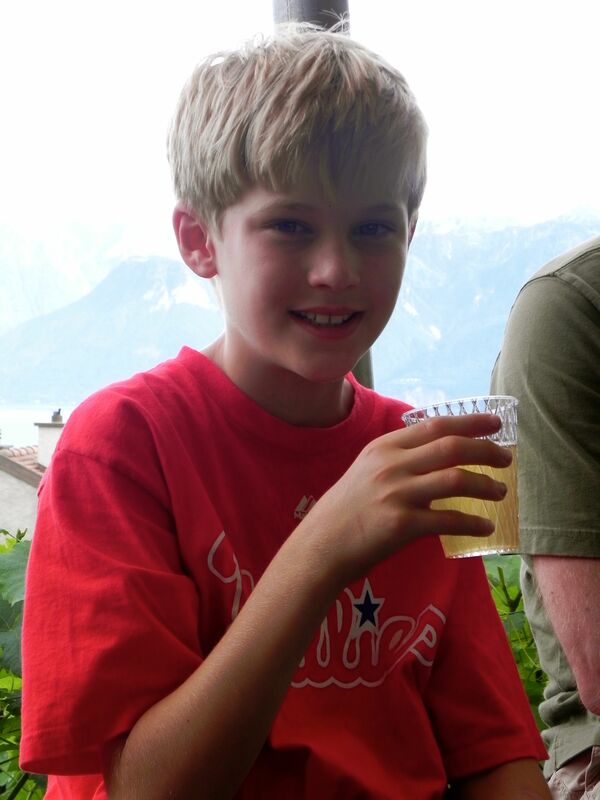 More on Switzerland later this week, including a visit to a castle, the Alps, and of course, fondue. 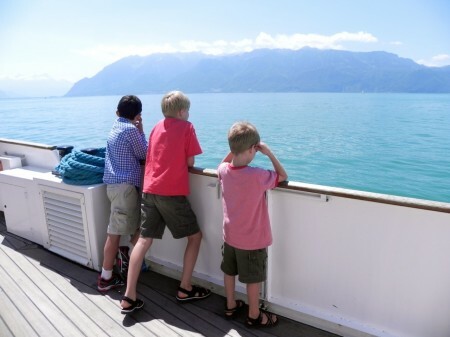 Want more information on taking a boat ride on Lake Léman or tons of tips about skiing in Switzerland with kids? 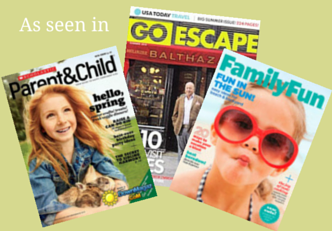 Be sure to check out all of the Switzerland family travel resources at Ciao Bambino! Hi, great post ! Can I reuse one of your pictures, the one with the boy jumping in the lake ? Please let me know 🙂 Thanks.